As you are reading this sentence, 163 journalists are kept in Turkish prisons being unable to report about Erdoğan’s post-referendum crackdown. And while you will be hearing more about Turkey’s declining press freedom record this week, 5,182 academics will be looking for a job instead of doing research, as they were dismissed from their universities by government decrees. The situation in Turkey is indeed grim, that is what the international observers and foreign correspondents had been reporting for the last few years. But it did not hit the bottom yet; people in Turkey have still got a lot to lose, and there is hope, albeit little, to overturn this decay if they can get the right support, right now. Last week, Reporters Without Borders (RSF) dropped Turkey’s rank even lower on its annual World Press Freedom Index, describing the dire conditions that Turkish journalists are facing everyday: “Dozens of journalists have been imprisoned without trial, turning Turkey into the world’s biggest prison for media personnel. Those still free are exposed to other forms of arbitrary treatment including waves of trials, withdrawal of press cards, cancellation of passports, and seizure of assets.” Even RSF’s Turkey representative Erol Önderoğlu has been jailed for 10 days for his solidarity with the Kurdish newspaper Özgür Gündem. Freedom House concurred with RSF on its Freedom of the Press 2017 report over the weekend, explaining the new layers of Turkey’s crackdown on media using the State of Emergency as a pretext: “Authorities shuttered scores of outlets, forcing thousands of journalists and media workers out of their jobs, and clamped down on social media and critical websites.” At least 103 more journalists have arrest orders in their name, such as reporter Arzu Yıldız, who was also stripped of her parental rights last May as part of her sentence for reporting on Turkey’s arms shipment to Syria. Yıldız now lives in exile, like hundreds of Turkish journalists. But the Turkish government violates their rights even in exile, like in the case of Sevgi Akarçeşme, the former editor-in-chief of Today’s Zaman, who had her passport cancelled by the Turkish government while she was flying from Belgium to the United States. 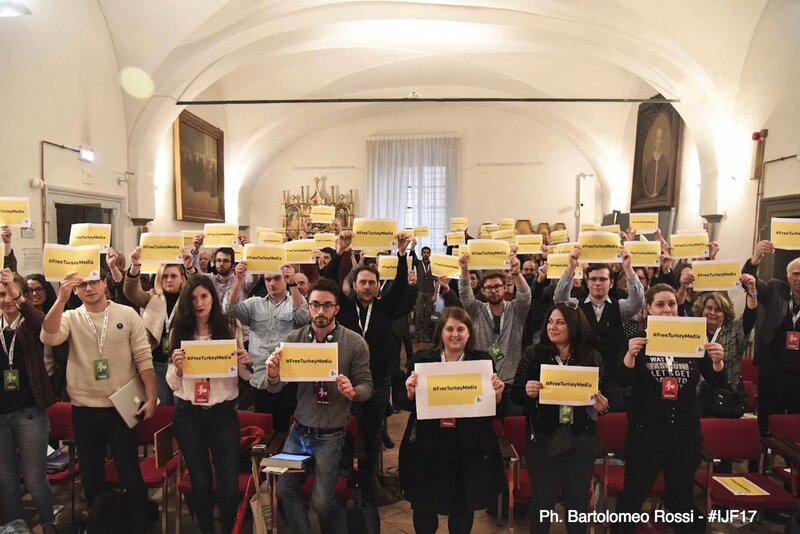 Turkish academics are facing nothing less, with their families collectively punished and excluded as ‘traitors’ in an increasingly polarised society. Those who voiced their criticism are receiving death threats too, next to losing their jobs and tenures, in an increasingly threatening country. Calls for academic freedoms from all over the world fell on deaf ears in Turkey. When the sacked academics and jailed reporters become the reported, it is often overlooked why they were arrested or dismissed in the first place. But in fact, they were the canaries in Turkey’s troubled democracy and the silencing of their criticism was the means to an end, up until where no dissidents could dare to speak out. In early 2000s, the ruling AK Party governments under Erdoğan’s leadership over the years followed a liberal reformist agenda and put Turkey on a roadmap that would eventually lead to EU membership. This was when the NATO member country with a majority Muslim population was perceived and promoted as a role model for the Middle East. Yet, the signs of Erdoğan’s authoritarian tendencies were already there. As early as 2008, one of Turkey’s quality newspapers Sabah and a leading private TV channel ATV was sold to a company run by Erdoğan’s son-in-law through a state-controlled tender. 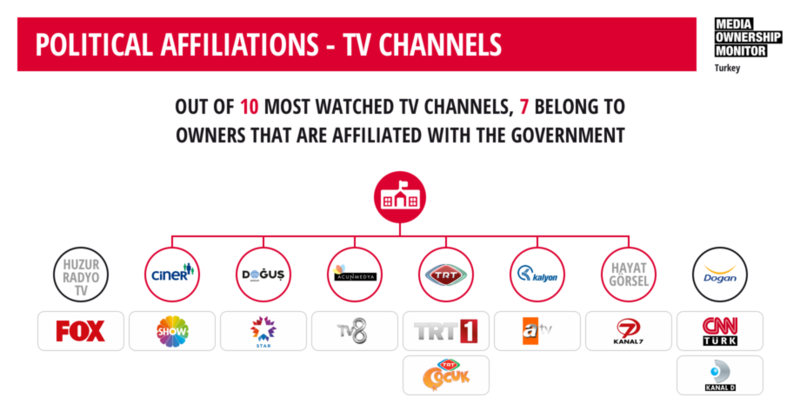 Gradually, the intermingling family ties, business interests, and political gains created a media ownership structure where pro-Erdoğan editorial lines were (and still are) awarded with more state tenders in construction and infrastructure projects. In June 2013, when the world witnessed the violent suppression of the massive ‘Gezi Park’ protests, Turkish citizens were finding out the extent of government control over the media —vividly clear by the absence of the news coverage on TV channels. The following year, Erdoğan aimed even higher by banning Twitter and YouTube right before the March 2014 elections, when the evidence of government corruption spread like wildfire on social media. Blanket censorship of news and commentary was made possible by amendments to the country’s Internet Law, allowing corrupt politicians to hide behind ‘defamation’ lawsuits against journalists. During the summer of 2015, new amendments made ‘national security’ the passphrase for blocking news websites and issuing gag orders, as the Kurdish conflict intensified in the Southeast and the Syrian war spilled over the border with bomb attacks in Turkish cities. Last July’s coup attempt did not change this security discourse, but added more unchecked tools to the government’s arsenal on its clampdown on freedom of speech, both on traditional and online media. According to the data collected by the independent journalism platform P24, the Turkish government has shut down 5 news agencies, 20 magazines, 28 TV channels, 31 radio stations and 64 newspapers in the post-coup period by using the state of emergency powers. Jailed Turkish journalists, shut down media outlets and dismissed academics are essentially accused of the same crime, “terrorism,” so broadly defined that it serves nothing but to punish government criticism. In the indictment that put 18 employees of the secularist daily Cumhuriyet, the state prosecutors have repeatedly argued that the daily’s editorial line “supported terror organisations” by criticising government’s security policy. And in all of the state of emergency decrees that purged more than 134,000 public employees since the last July’s coup attempt, the government maintains the same line “[listed employees] have membership of, affiliation, link or connection with terrorist organisations.” Yet no evidence and no access to a fair trial is given, making both the purges and the mass arrests unconstitutional according to the Council of Europe legal body. Yet, Turkey’s reality is beyond unjust. All in all, Turkey’s problem boils down to the central question of government systems: How to check and balance the people in power? In Turkey’s case, media became the first victim and the enabler for the rest of the estates to fall. Without reporters to reveal the abuse of power, corruption and misconduct; and without intellectuals and academics given a platform to tell the threat of authoritarianism to the society, Turkish electorate did not have the chance to choose between good and bad governance. Instead, mainstream media became instrumental in amplifying ruling party’s propaganda to redefine right and wrong, while turning a blind eye to the criticism of power. Consecutive election wins gave Erdoğan the legislative support for tailoring the law to his needs, and the law paved the way for a new cadre of partizan judges and prosecutors to impose his will. So, the failure of the checks and balances system, the rule of law, is the last victim, marking the end of a democratic republic in Turkey. The referendum, held on April 16, has only put a new name to this de facto regime change that has been in the coming for the last decade. The solution can only begin where it all started to go wrong, with the press freedoms; and Turkey’s last hope remains at the hands of its survivors, the journalists who still has the courage to tell the truth. Given the current media structure and the legal situation, Turkey’s independent media will obviously seek support and protection abroad, as it is no coincidence that hundreds of journalists already sought refuge in exile. It is easy to fall in despair when you are watching Turkey from abroad, but Turkey’s chances to survive depend a lot on those who can help from afar. Efe Kerem Sözeri is the editor-in-chief of Dekadans.co, founded after the independent news outlet he worked for, Jiyan.org, was banned in Turkey. His freelance work on freedom of speech and censorship in Turkey has appeared on P24 and Bianet in Turkish, and on The Daily Dot and Global Voices in English.